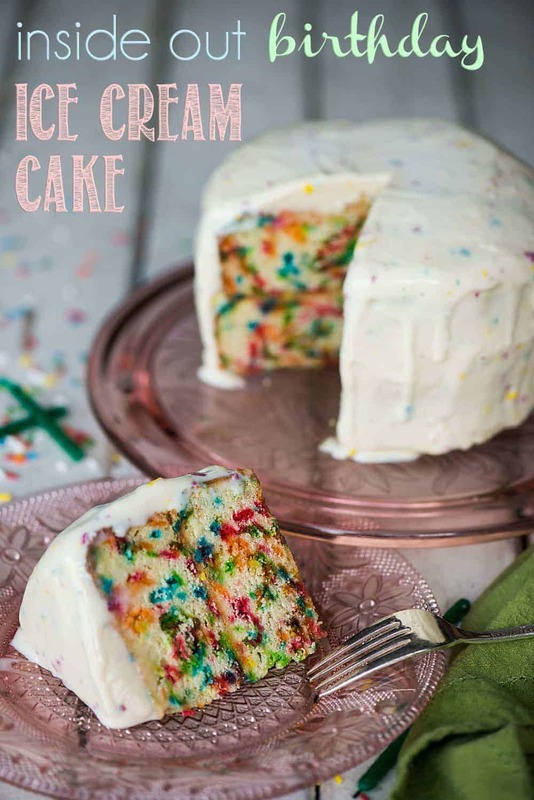 Ditch the frosting and enjoy this colorful Inside Out Birthday Ice Cream Cake made with homemade sprinkle filled cake and topped with creamy birthday cake ice cream. There are three things I can pretty much guarantee everyone loves: ice cream, cake, and sprinkles! 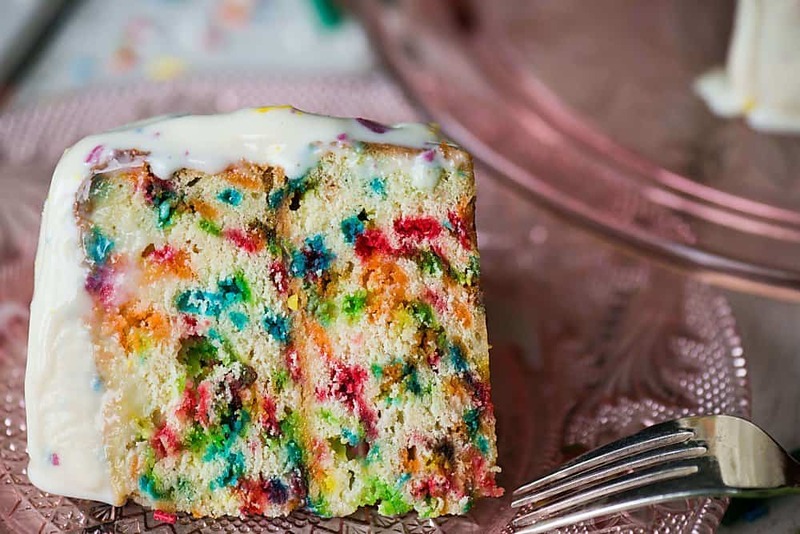 There’s just something about that birthday cake flavor and the bursts of vibrant colors that brings a smile to your face. Admit it. 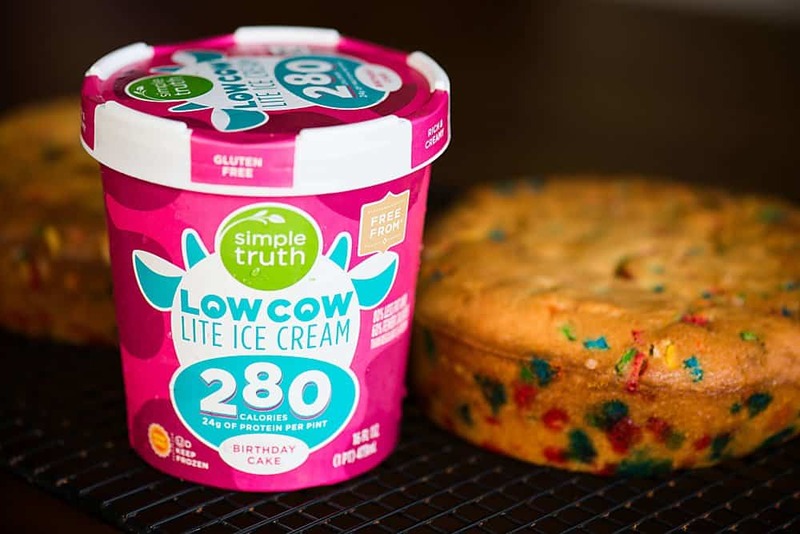 I just discovered this new Simple Truth Low Cow Lite Ice Cream. 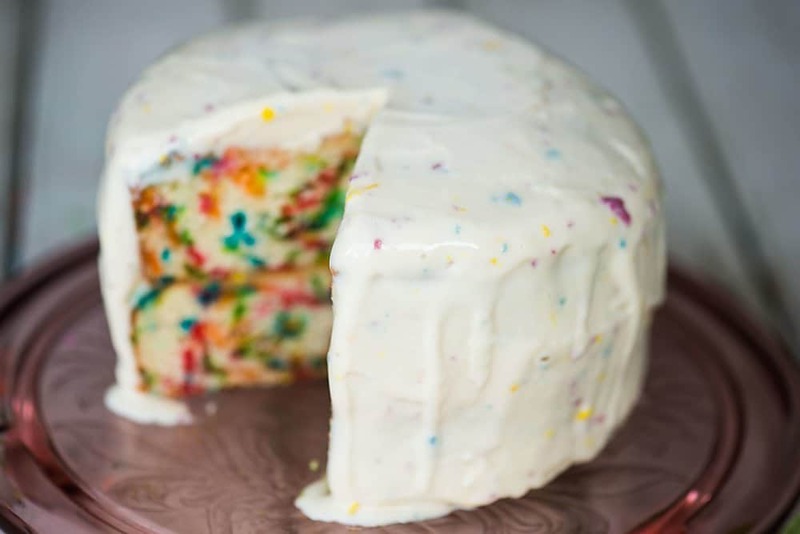 As soon as I saw that they have birthday cake flavor, I knew I wanted to make a homemade cake full of sprinkles from scratch. 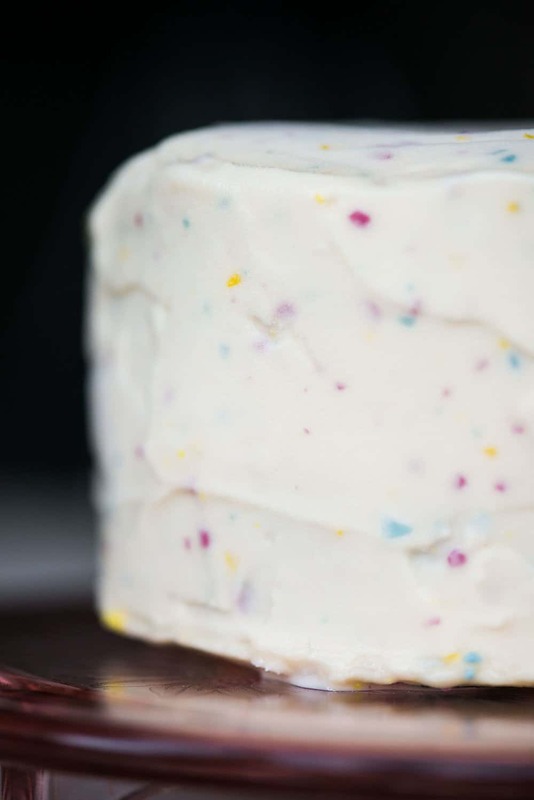 I love ice cream cakes, especially as a summer dessert, so I thought it would be super fun to shake things up a bit and use this awesome ice cream instead of frosting. Low Calorie (80% less fat and 60% fewer calories than regular ice cream) – yes please. High in protein (24g per pint) – always good to feel full after dessert! Rich and creamy. It actually tastes like real ice cream without any chalky aftertaste. 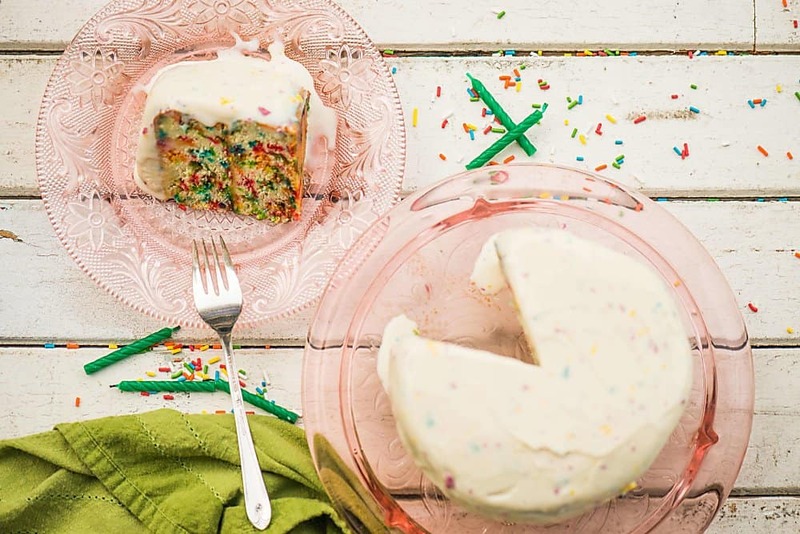 Because its part of the Simple Truth line, you can trust that it is high quality and free from artificial ingredients (all those awesome colors in the sprinkles were made from natural vegetable based products). …and it’s available in 6 flavors: Chocolate, Vanilla Bean, Sea Salt Caramel, Lemon Cake, Mint Chocolate Chip, Birthday Cake (feel free to try one a day). Additionally, it is at a better price than competitive ice creams. You want some now, don’t you? The only place you can get this awesome ice cream is at a Kroger store, so if you’re lucky you live near one! I actually ordered my Low Cow ice cream as well as another couple hundred dollars worth of groceries (hello, sale on my favorite coffee) thru Clicklist. Have you tried it? Why oh why did it take me so long to discover how amazing this service is! Because I use my Fred Meyer card every time I shop, the store knows what I always buy. I’ve always avoided online grocery shopping because I didn’t want to do a search for every single thing I wanted to buy. Since everything I buy was already loaded, all I had to do was select how much of each item I wanted and I scheduled pickup for a time that worked with my schedule. SO. RIDICULOUSLY. EASY. Anyway, I always love to share my mistakes with you guys. Not everything I make turns out perfect. 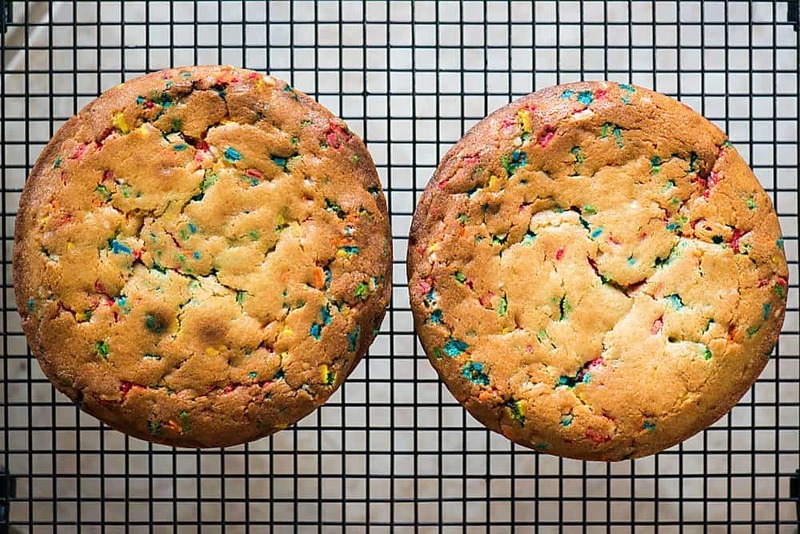 These cakes turned out beautifully, so you can definitely trust the recipe. The major mistake I made, though, was thinking I could put ice cream on a cake that was slightly warmer than room temperature on a hot day, stick in in the freezer, and make it work. Nope. Turns out ice cream melts when it gets hot. Lesson of the story: freeze your cake before you put the ice cream on top. I was also a little nervous that I wouldn’t be able to cut into a frozen cake. The alternative would be to let it warm up to room temperature and then I’d be stuck with that same sticky melted ice cream situation. I’m happy to report that dipping a very sharp knife in a tall glass of very hot water before each cut does the trick beautifully! 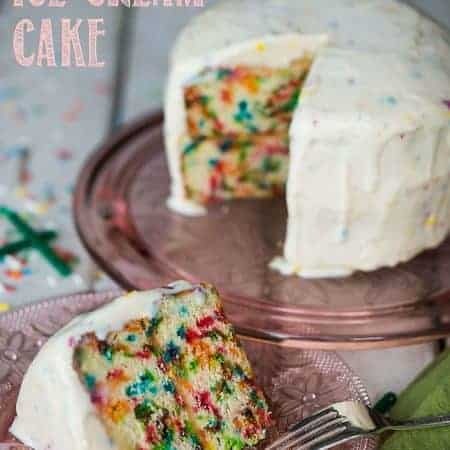 The cake is a moist, dense, and perfectly sweet color bomb and the Low Cow Birthday Cake Ice cream adds a sweet, creamy, delicious alternative to ice cream. Its basically the perfect summer dessert! 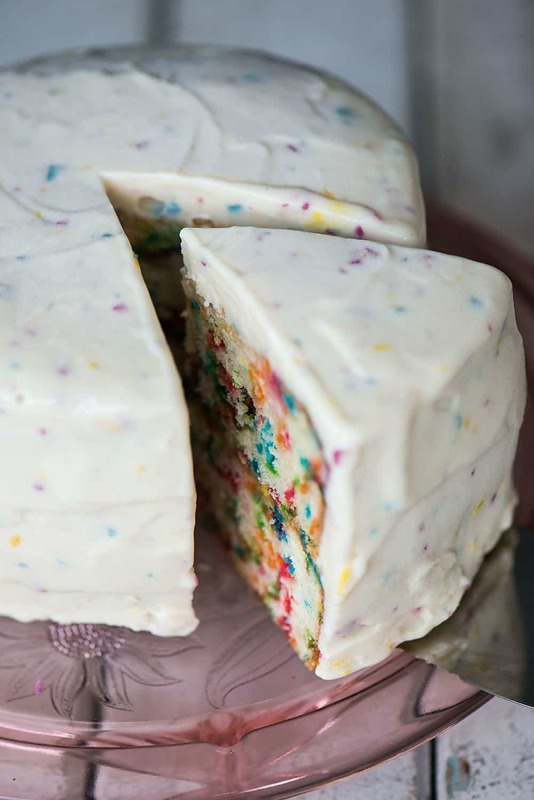 Ditch the frosting and enjoy this colorful Inside Out Birthday Ice Cream Cake made with homemade sprinkle filled cake and creamy birthday cake ice cream. Preheat oven to 350F degrees. Spray two 6-inch (or one 9-inch baking pan with nonstick oil (I used olive oil spray). Set aside. In bowl of a stand mixer, mix together flour, sugar, baking powder, baking soda, and salt. With the paddle attachment and low speed, mix the dry ingredients to fully combine. Drop chunks of the softened butter into the dry ingredients until the entire amount has been added. Increase speed to medium and mix until most of the butter appears well coated by the dry ingredients (you should see peas size amounts of the butter). Meanwhile in a separate container, mix together egg, yogurt, milk, vanilla and almond extracts until combined. With the mixer running on medium speed, add about half of the wet ingredients. Then, turn speed up to high and mix for about a minute until the mixture is light and fluffy. Reduce speed to low and add remaining liquid. Slowly mix until well combined, but don't over mix. 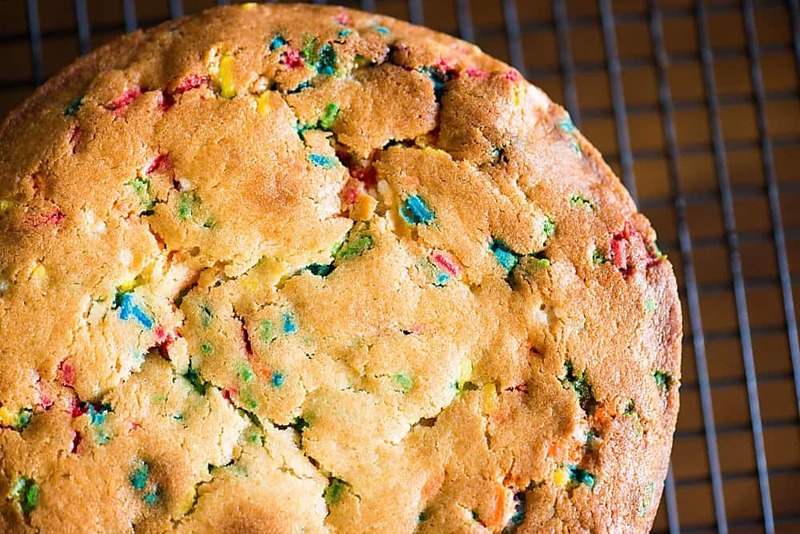 Using a large spoon, gently fold in sprinkles, taking care not to over mix as the color can bleed. Pour batter into cake pan(s) and bake in preheated oven around 35 minutes or until top of cake(s) is golden brown and a toothpick inserted into the middle comes out clean. Remove from oven and allow to cool in pan on cooling rack until cool enough to touch, then remove cake(s) from pan(s) and allow to finish cooling on rack. Wrap cake(s) in plastic wrap and freeze at least one hour. To "frost" cake with ice cream, allow ice cream to soften at room temperature, stir well, and then spread over frozen cake(s). Place finished cake back in freezer until ready to serve. To slice, dip large sharp knife into a glass of very hot water before each cut. Enjoy!